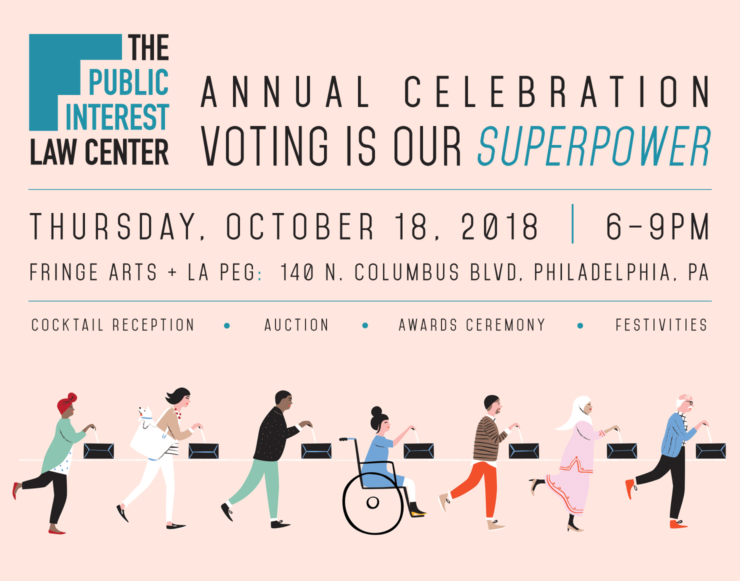 Join us at our annual celebration of the Law Center's mission and help us honor some of our esteemed partners with the Thaddeus Stevens Awards. FringeArts is an accessible location. If you have physical accessibility needs or require an ASL interpreter please contact Michael Berton at mberton@pubintlaw.org or 267-546-1303. Anyone can join the fun and support our work, whether or not you plan to attend our annual celebration. Place your bids now on more than 30 one-of-a-kind items and experiences, and remember, all proceeds support the Law Center. Interested in becoming a Sponsor of our 2018 Annual Celebration? Download a Sponsorship Packet from the link below for more information and be sure to check out our current list of 2018 Annual Celebration Sponsors. The deadline to become a Sponsor is October 2! Valet parking will be available for a fee onsite: 140 North Columbus Blvd. Please check the FringeArts website for information about additional parking options. Please check SEPTA for all schedules. Times may vary greatly. The Market-Frankford line stops at 2nd & Market Street. Approximately a 10-minute walk to FringeArts. From the subway stop, head North on 2nd St. towards Church Street. Turn right at Race Street. and walk towards the waterfront. FringeArts will be on your right at the corner of Race Street. and Columbus Blvd. Connections to the Market-Frankford Line: take trains headed towards Frankford Transportation Center and exit at 2nd Street stop. #25 Frankford Transportation Center to Columbus Commons: Stops at corner of N. Columbus Blvd. and Race St. (directly across the street from our building) or S. Columbus Blvd. (between our building at the Holiday Inn). Approximately a 1-minute walk to FringeArts. #21 Penn’s Landing to 69th Street Transportation Center, #33 Penn’s Landing to 23rd-Venango & #42 Penn’s Landing to Wycombe: Stops at Columbus Blvd. & Penn’s Landing. Approximately a 4-minute walk to FringeArts. Head North on Columbus Blvd. towards the Ben Franklin Bridge. FringeArts is located across the street at the corner of Race St. & Columbus Blvd. #5 Front-Market to Frankford Transportation Center: Stops at 2nd St. & Race St. Approximately a 5-minute walk to FringeArts. Head down Race St. towards the waterfront until you reach Columbus Blvd. FringeArts will be on your right, on the corner. #57 Whitman Plaza to Rising Sun-Olney or Fern Rock Transportation Center:Stops at 4th St. & Race St. Approximately a 6-minute walk to FringeArts. Head down Race St. towards the waterfront until you reach Columbus Blvd. FringeArts will be on your right, on the corner. #48 Front-Market to 27th-Allegheny: Stops at 2nd St. & Arch St. Approximately a 7-minute walk to FringeArts. Head North on 2nd St. towards Race St. Turn right onto Race St. and continue until you reach the Columbus Blvd. We will be on your right, on the corner. #17 Front-Market to 20th-Johnston and Broad-Pattison: Stops at 2nd St. & Market St. Approximately a 10-minute walk to FringeArts. First, take the pedestrian bridge at the end of Market St. When you reach the opposite end, head down the set of stairs on the left-hand side. From the stairs, turn right and walk up Columbus Blvd. towards the Ben Franklin Bridge. We are across the street at the corner of Race St. & Columbus Blvd. PATCO Stops at 8th St. & Market St. Approximately a 20-minute walk to FringeArts or change to the Market-Frankford Line to 2nd & Market St. stop for a 10-minute walk. Walk down Market St., take the pedestrian bridge, and head down the set of stairs on the left hand side when you reach the opposite end. From stairs, turn right and walk up Columbus Blvd. towards the Ben Franklin Bridge. We are across the street at the corner of Race St. & Columbus St. Click here for the PATCO schedule.